The Animantarx dinosaur is a rather interesting dinosaur that lived during the late Cretaceous period. It was an herbivore that was indigenous to western North America and was also very slow moving. This breed of dinosaurs was cover with heavy armor scouts but did not have a tail club like other Nodosaurids. This dino is estimated to have been approximately 10 feet long based on its scull size which was measured at 10 inches long. The name was based on the Latin word animatus which means animated and fortress because of its extremely armored nature. There has only been one Animantarx discovered and the only parts that were found were the skull and parts of the vertebrae. 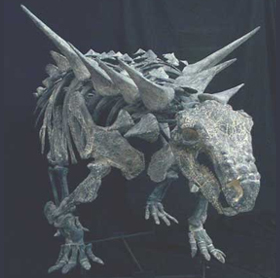 According to the Yale review, this dino was discovered by Ramal Jones in 1914. Animantarx is characterized by a unique combination of features, including a highly domed skull back, small horns on the postorbital and quadratojugal bones of the skull, and a mandible which is only armored on half of its length. These fossil remains happened to be discovered in Cedar Mountain Formation in the eastern portion of Utah. Fossils in this region are often slightly radioactive, and remains of Animantarx were actually discovered following a radiological survey of the area, which registered a higher level of radioactivity at this particular location.